New research into the changing ecology of thousands of shallow lakes on the North Slope of Alaska suggests that in scenarios of increasing global temperatures, methane-generating microbes, found in thawing lake sediments, may ramp up production of the potent greenhouse gas - which has a global warming potential 25 times greater than carbon dioxide. A study published this month in Geobiology - resulting from five-years of collaborative research led by Nevada's Desert Research Institute (DRI) and including scientists from NASA's Jet Propulsion Laboratory (JPL), Montana State University, and University of California, Riverside - illustrates how the decomposition of organic matter in thermokast lake sediments can produce up to three times more biological methane gas emissions when subjected to increased temperatures in a simulated environment. 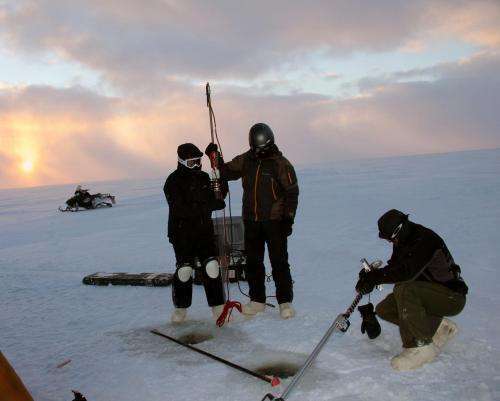 "The large amount of organic matter stored in the thaw layer between the water column and the permafrost table serves as a significant source of carbon for methanogensis," explained Paula Matheus Carnevali, a doctoral student at DRI and the study's lead author. 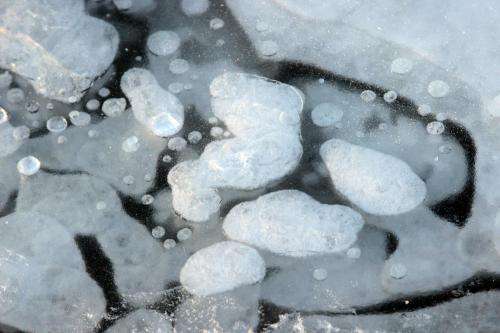 "Identifying and understanding the production sources of methane will improve our ability to generate accurate predictions about the changing climate in the Arctic." "This study marks an important step in recognizing that there are different methane sources in close proximity that may respond differently in the changing Alaskan arctic ecosystems," said Alison Murray, Ph.D., a principal investigator on the study and expert in microbial ecology and archaea found in some of Earth's most extreme environments. "In scenarios of warming climate," Murray said, "our measurements indicate that biological methane production may play a larger role in total methane emissions in the future, which could have a significant impact on our climate." I guess i should be pleased by the 25 times number here, much better than the 67x number in Kyoto. It is hard to set a single ratio between CH4 (methane) and CO2, because CH4 rises more rapidly, but then ultraviolet light converts it into CO2 at a one-to-one molecular ratio. If you go by weight, not gas volume, CH4 contains 2.75 times as much carbon as CO2. That's probably the number to use, since CH4 turns into CO2 in less than a year, and the CO2 stays in the atmosphere for a century or so. Thinking about it, that last sentence is misleading. Any particular CO2 molecule lasts on order of a decade in the atmosphere, but the time constant for excess CO2 seems to be longer than a century.